The other week when I made the asparagus and ramp pesto pasta I realized that even though I use spinach in pestos a lot, it always plays a supporting role and it is never the star. 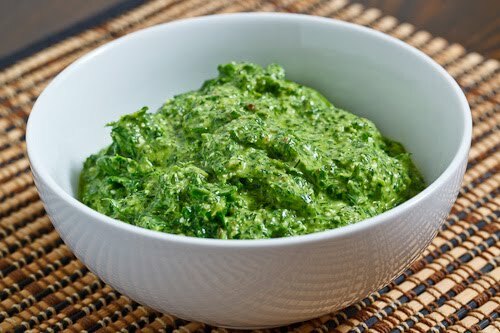 This got me to thinking and one thing led to another and I soon found myself remembering spanakopita, a Greek spinach pie , and before I knew it I was coming up with a way to include all of the flavours of spanakopita in a spinach pesto. One of my favourite things about spanakopita is all of the fresh herbs so I had to include some fresh dill, mint and parsley in the pesto. Pestos often include a nut and the walnut seemed like the natural choice as thoughts of baklava danced through my head. Of course the cheese just had to feta! The spanakopita pesto turned out great! It has all of the flavours of spanakopita including an amazing freshness that just screams spring. Place everything into a food processor and blend. This looks VERY delicious! I can't wait to try it. There's actually a Feta cheese from Costco made with Sheep's milk – it's the best tasting Feta my Grandparents ever tried they said. I would try using that. This looks like it would go nicely on top of Kjoftinja (Macedonian meatballs), or with some Pita, yogurt, olives, peppers or some Ajvar. Anonymous: What brand is it? I have been enjoying the Krinos sheep and/or or goat milk feta lately when I can't make it down to Greek Town. This is a fabulous recipe, especially as part of the grilled cheese sandwich. Making it this weekend for the second time. Thanks so much for your great blog.